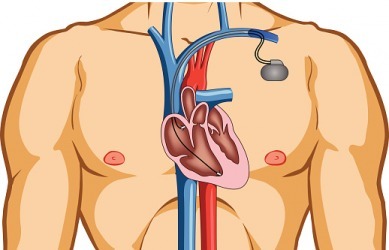 An illustration of pacemaker in the chest. The definition of the pacemaker is a small device used in medicine to regulate the beating of a heart. In 1926, Dr. Mark Lidwell, along with Edgar Booth, invented a portable device that could plug into a lighting point and the other half of the device could be plug into the corresponding cardiac chamber. Albert Hyman created his own version of the pacemaker in 1932. His device was powered by a spring-wound, hand-cranked motor. In 1950, John Hopps then built the first external pacemaker. In 1957, Earl Bakken created the first wearable external pacemaker. In 1958, the completely implantable pacemaker was inserted into an individual in Sweden. Unfortunately, the device was not successful and failed after three hours. The patient, Arne Larsson, received over twenty different pacemakers in his lifespan. In 1971, isotopes were replaced with lithium anode cells. The creation of a titanium metal encasement for the pacemaker was the final major breakthrough in the field. An example of the pacemaker is a small device that is implanted in the chest that uses electrical impulses to regulate the heart beat. "pacemaker." YourDictionary, n.d. Web. 19 April 2019. <https://www.yourdictionary.com/Pacemaker>. Sports One who sets the pace in a race. Also called pacer . Also called pacesetter . A leader in a field: the fashion house that is the pacemaker. Also called pacesetter . Any of several usually miniaturized and surgically implanted electronic devices used to stimulate or regulate contractions of the heart muscle. Electrodes attached to the heart muscle conduct electrical signals generated from the pacemaker, which either provides constant electrical stimuli to regularize the heartbeat (fixed-rate pacemakers) or provides a stimulus only when electrical activity within the heart is abnormal (demand pacemakers). Pacemakers are used in the treatment of various arrhythmias. A part of the body, such as the specialized mass of cardiac muscle fibers of the sinoatrial node, that sets the pace or rhythm of physiological activity. One who sets the pace in a race, to guide the others. (anatomy) A set of nerves which stimulate the heart to beat. (hence, medicine) A medical implement that is used to stimulate a heart to beat by simulating the action of the natural pacemaker. A part of the body, such as the mass of muscle fibers of the sinoatrial node, that sets the pace or rhythm of physiological activity. Any of several usually miniaturized and surgically implanted electronic devices used to stimulate or regulate contractions of the heart muscle. Most men with EDMD survive into middle age, although a defect in the heart's rhythm (heart block) may be fatal if not treated with a pacemaker. A pacemaker is a device that sends small electrical impulses to the heart muscle to maintain a suitable heart rate. Elton is an epileptic, and in 1999, he was diagnosed with an irregular heartbeat and fitted with a pacemaker. Irregularities in heartbeat may be treated with medication or a pacemaker. A pacemaker may be implanted if these do not provide adequate control.